The shed roof overhang is an important but neglected aspect of shed roof design. 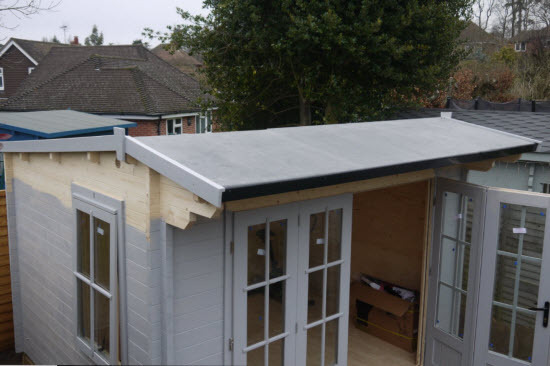 Read on to find out the reasons for incorporating an overhang as part of your shed roof and how to frame roof overhangs on different edges of a roof. Firstly why do you need to incorporate a shed roof overhang? The practical reasons for incorporating an overhang are for protection of the building and its occupants from the sun and the rain. Having an overhang by the door of the shed makes it just that little bit easier when dashing to get into the shed when it is pouring with rain. This sort of overhang isn't quite a porch but just a bit of extra protection when trying to find your keys. A more important aspect of the overhang is the comfort of the user inside the shed on hot days. The eaves overhang provides shading to the windows that limits direct sunlight entering the shed. Which in turn keeps the interior of the shed cooler. 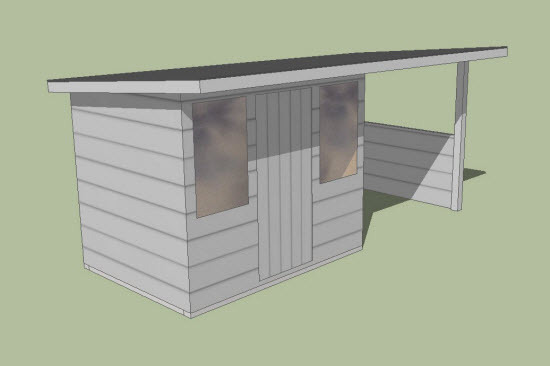 Shed with overhang to front and side. Protecting the occupants from rain and sun. Having a roof overhang protects the walls and the base of the shed. The roof overhang gives a lot of protection above doors and windows from rain. Even wind driven rain finds it difficult to enter a shed when protected by a relatively small overhang. At the bottom of the shed wall the fact that water from the roof is being directed away from the shed means that the base of the shed gets less persistently damp. When added to the use of a gutter to collect roof water the damage to the shed walls is minimised. In addition to the practical considerations designing a roof overhang into your shed helps to provide contrast and a sense of depth to the appearance of the building. These aspects are hard to quantify but when you look at cheap sheds they often seem to look 'flat' and don't have much character. Once you start looking it is something that you can't 'un-see'. Having a well-proportioned roof overhang definitely gives a building more of a quality appearance. The relatively large eaves on this building and guttering system mean that the base of the shed rarely gets wet. Prolonging the life of the building. 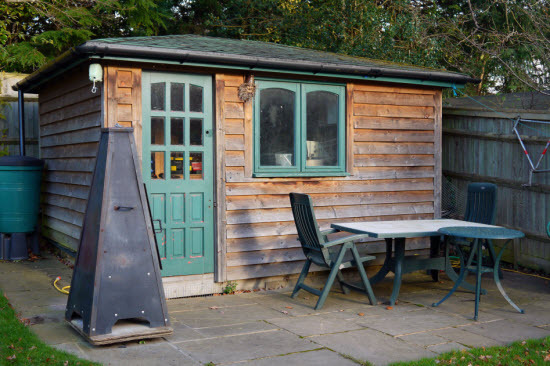 What is the ideal shed roof overhang? The ideal shed roof overhang depends on the purpose of the overhang, the location and microclimate of the building. 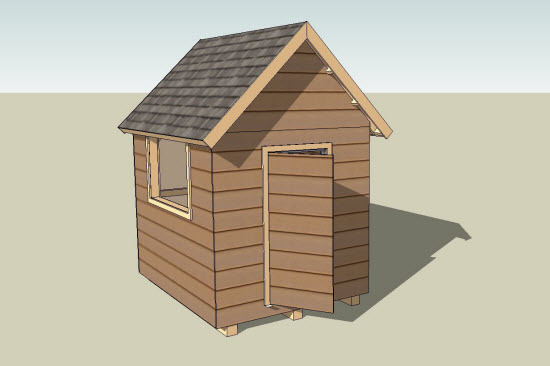 An overhang to protect the shed user on a rainy night could be relatively small whereas an overhang to provide a shaded area in front of the shed to keep the interior of the shed cool will be much larger. With respect to providing protection from the rain for buildings with an 8ft eaves height then a 150mm eaves projection is about right. This gives protection to the junction wall and door/window heads. It also means that splashes from water dripping off the roof falls further from the building and so dampens the base of the shed less. Having a guttering system reduces this effect most. An alternative is to use a gravel strip around the base of the shed so that any rain falling from the edge of the roof is dispersed rather than bouncing off a hard surface or from a puddle. 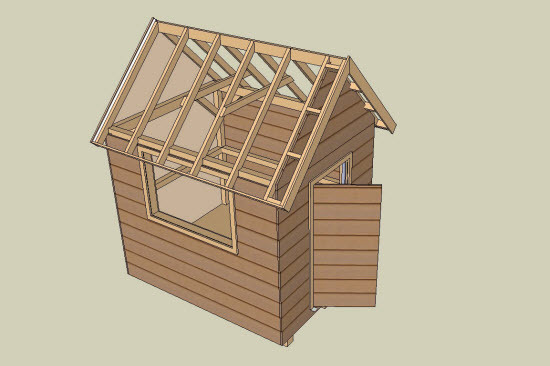 How do you frame a shed roof overhang? Forming a roof overhang is different dependant on the style of roof and also on which edge of the roof is being considered. Let's have a look at two different popular roof styles. In the direction of the roof span the roof member simply cantilevers past the wall plate. On the other edge a 'gable ladder' is constructed which is formed from two rafters with 'noggins' between that support the end rafter. The noggins extend back for a series of three rafters. The roof overhang occurs in a similar way to the pent roof in that the top chord of the roof truss projects past the wall plate by the desired amount. In the opposing direction a gable ladder is formed in a very similar way to the pent roof. The roof trusses don't extend out beyond the wall line. Just the top chord of the roof with the noggins going back into the roof a distance of three rafters. So why don't mass produced sheds incorporate them? One obvious reason is simplicity and economy. If you are making sheds to compete at as low a price-point as possible then you will want to cut out as many elements as possible. Many consumers don't realise the benefits of a good shed overhang and so are distracted by the low price. Not realising that this 'false economy' will come back to haunt them in a reduced lifespan of the shed that they are buying. Also they will get reduced utility out of the shed from the shading and sheltering provided by a well-designed overhang. Alternatively if I was to put on my tin foil hat. I could say that the reason is that manufacturers don't want their products to last too long so that they can sell another one sooner! This is probably a step to far. It will help your shed to last longer and also you will get greater comfort out of a shed with the additional shelter and shading provided. Your shed will also look better too.